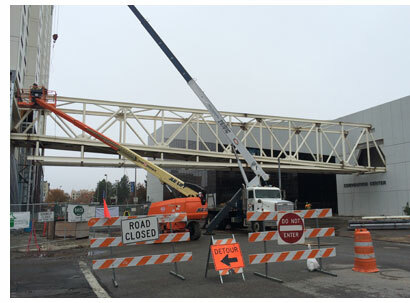 The skybridge connecting the Davenport Grand Hotel and the Spokane Convention Center was installed on December 7. Joining the DoubleTree by Hilton Spokane City Center, the Davenport Grand Hotel will be the second connected hotel to the Spokane Convention Center. With an expansion project expected to be completed in January 2015, the Spokane Convention Center will total more than 500,000 square feet, including 120,000 square feet of exhibit space and 83,512 square feet of meeting space. The 17-story Davenport Grand Hotel is projected to be completed in summer 2015 and will have 62,500 square feet of meeting space. The 716-room hotel will be joining the Autograph Hotel Collection by Marriott. With the addition of the new hotel, a total of 1,100 rooms will be connected to the Convention Center. Additionally, the number of hotel rooms within eight blocks of the Convention Center rises to 3,300.